BuzzFeed has created its first smart appliance: a Bluetooth-enabled induction cooktop that will connect directly to a new iPhone app for Tasty, its popular cooking vertical. Users can choose a recipe from the Tasty app and send it to the appliance, called the Tasty One Top, to help cook the meal. The cooktop can track the surface temperature of a pan or pot and the internal temperature of the food, using induction technology. The Tasty One Top alerts users when it is time to add different ingredients, time to flip that steak, or when the food is done. The buttons on the induction cooktop also allow it to be used without the Tasty app. For example, it can be used for pan cooking, pot cooking, slow cooking and sous vide. The appliance was designed by BuzzFeed Product Labs, the same team that created the popular personalized Tasty Cookbooks. GE Appliance’s First Build team helped bring the device to life, but the Tasty One Top is not a licensed product and is wholly owned by BuzzFeed. Ben Kaufman, head of BuzzFeed Product Labs, which was created in October 2016, told Publishers Daily his team “wanted to make a product that brought Tasty content to life and made it even easier to cook Tasty recipes. When we think about products here at BuzzFeed, we think about how to make them social and sharable, and nothing is more social than a great meal." As advertising revenue from more traditional avenues decline, new revenue streams become vital for publishers. The Tasty app, which is coming to Android soon, allows users to find recipes based on available ingredients, time of day, social event, difficulty, speed or dietary needs. It currently houses almost 1,700 video recipes. 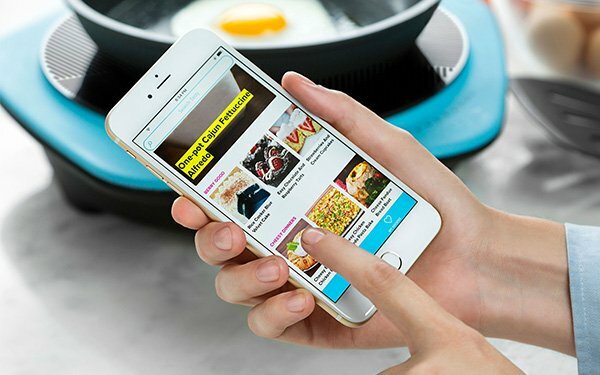 The cooktop and app are announced just as BuzzFeed’s Tasty brand celebrates its second birthday today. BuzzFeed claims Tasty now reaches one in four Facebook users worldwide and attracts 2.3 billion videos views every month. The Tasty One Top can be pre-ordered in the U.S. for $149 at www.tastyonetop.com. It begins shipping this November.